Posted on September 28, 2007 | Posted in News | Posted by Philip | Comments Off on iPhones "Unlocked" now don't work. According to Iphone Simm Free the iPhone 1.1.1 update does not “brick” an iPhone but makes it no longer capable of being used on non-AT&T networks. So for those in Australia trying to use Telstra’s network to run an Apple iPhone you are out of luck until a fix is produced by IPhone Simm Free. 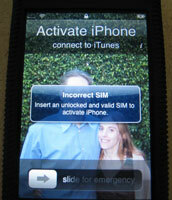 According to MacWorld however the re installation of an AT&T SIMM may not be as simple as it sounds and perhaps some unlocked phones may indeed be “bricked”. If the latter is true I don’t think this is good news for Apple, hundreds of angry, albeit warned customers cannot be a good thing.